Book Review: Jack London and Captain! David! Grief! On the back is a closeup of that grimacing face. I saw this one, by Jack London, with that unbelievable cover, and I just had to buy it. Took me a while to get around to reading it, though. Because I don’t know how I actually feel about a character named Captain Grief. I mean, really? Captain Grief? Now, if he was a pirate, that would make sense; but he’s not. He’s a capitalist. A man’s man, taming the South China Sea with grit and pluck and stick-to-it-iveness, and sheer manneosity. Is that a word? Should be. Because with Captain David Grief, the manneosity never ends. But I did finally read it, and it was totally worth the wait, and the $3.95 I paid for it. Because, for one thing, Jack London really was a hell of a writer. I like the way he characterizes, and the descriptions of the South China Sea are detailed and interesting. He does action very well, particularly suspense and the kind of moment where you suddenly plunge into a much more serious danger than you thought was going to happen, like wading into the ocean and suddenly hitting a dropoff and you’re over your head and sinking. It’s a short book, and it was fun to read. It ain’t all wine and roses, though. It’s thoroughly racist, for one thing. 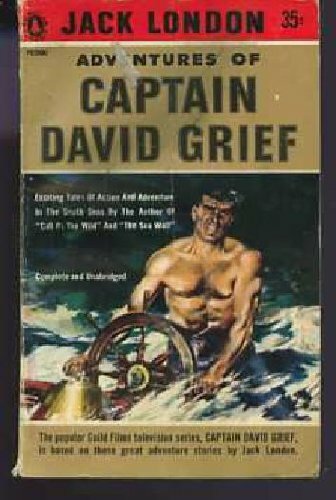 David Grief – bearer of the White Man’s Burden – is a millionaire entrepreneur who “tames” the “wild” islands of the South China Sea, Indonesia and Polynesia and Melanesia and Micronesia (Can’t believe there’s not a Griefanesia – but there will be soon, by God!) and forces them to turn a profit. He befriends the natives – described by color, dress, and essential level of savagery in comparison to the Mighty Grief – and convinces them, through a mixture of trade, bribery, and violence, to allow him to build plantations on their islands, which he then works for MIGHTY, MANLY PROFITS. Inasmuch as money is interesting, this aspect of the book is; I admit I dreamed of being a man tearing a living from the jungle through the strength of my arms and the quickness of my wit. And being rich sounds nice, too, which Captain Grief is. So, cool. But that’s not the main attraction here. The main attraction is the way Grief is fearless and capable in all things. The way he sails his ships better than anyone else, navigates better than anyone else, reads the seas and the skies better than anyone else (Actually, the sailing parts were really interesting. London knew a ton about ships, and sailed to Hawaii and elsewhere in this part of the world, and that knowledge shows. I liked it.). The way he assesses the value of pearls better than anyone else, and grows coconuts better than anyone else. The way he reads more books, knows more languages, and has been more places than anyone else. The way he always acts as a consummate gentleman, and gives a gentlemanly thrashing through whatever means are at hand for administering lessons, be it bare-knuckle fisticuffs, or bundles of dynamite, should that be called for – and in one case, it is – to anyone who doesn’t act as gentlemanly as he does. In one story, he beats a guy in a sailing race; in another, he beats a guy at cards; in my favorite, he just beats the guy with his fists, and then makes him spend days on end cleaning an old rusted chain until the guy knows what it is to be a man. A man who can hold his liquor, dammit. (The guy Grief beats is an alcoholic. Grief is, too, judging by the amount of drinking that goes on in the stories – but Grief, like a man, never gets drunk.) Of course it goes without saying that this sort of thing is only for the other white men; the savage islanders don’t get treated with the same respect. No thrashings for them. Grief trades them liquor and cigars and talks to them in pidgin, before sailing off with some exclusive trading contract back to the white-only country club resort island. I was stunned that there was no torrid affair, no woman he could seduce and then sail off, leaving her pining for him on a tropical beach under the Pacific sun. The book was goofy in a lot of ways, most definitely. But it was fun, too. And here’s the really funny thing (Other than the cover – and London’s original title for these stories, which was “Sun of the Son.”): they made a TV show out of this. If you like cheese and pulp and a dash of pirate, and the tropics, then I definitely recommend this.